This is our next Bible Coloring page about creation. This printable picture goes with the third day. This illustration was created by Mandy Groce, an illustrator based in Louisville, KY. If you enjoy these coloring sheets, be sure to leave her a comment with your feedback. 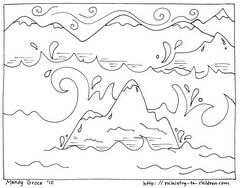 This line art illustration depicts the events from Genesis 1:9-10 where God separates the dry land from the sea. This is the moment when the continents emerged from the sea. 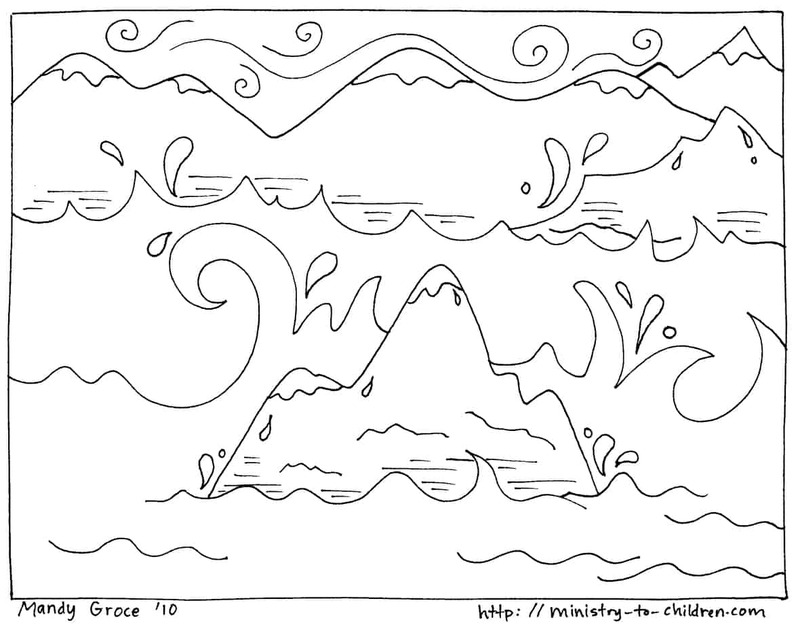 The coloring sheet shows the tops of mountains coming up out of a storm tossed ocean. This is commonly called the third day of creation. Directions: Click on the image above to download this resource as a printer friendly PDF file. Alternately, you can download the image as a jpeg image file (529K) if you want to resize or paste it into a Word Document. Be sure to check out all our coloring pages about creation. Thank you for your coloring pages. What a wonderful talent you have been given. I am new to teaching 1st and 2nd grade Sunday School and appreciate your coloring pages to use as part of my resources. May God bless you always. Thank you for all these wonderful resources. I am very excited to have extra help with activities to teach my little Sunday School ‘babies’ just how amazing God is!